In July of 2007 the editor of Micscape kindly accepted and published a paper of mine on the subject of silicoflagellates. 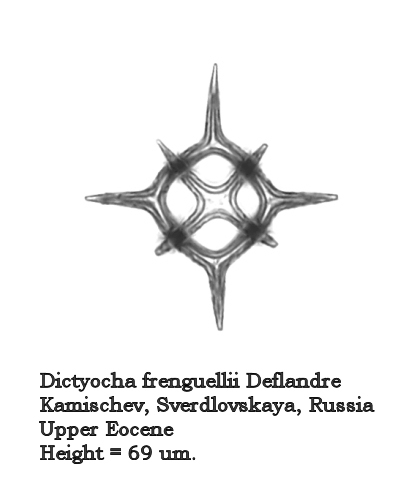 In the six months that have passed between then and now I have acquired a good bit of additional literature on these fascinating microfossils, particularly some Russian sources, and have had the opportunity to see many more specimens, from many additional localities. The result of this six months of fairly intensive study has been a felt need to extend the earlier paper, and to offer a number of corrections to it. Firstly, I can now give a name to the unidentified morphospecies of Naviculopsis that appeared in Figure 8 of the earlier paper: it is Naviculopsis robusta Deflandre. This very distinctive form from the Upper Paleocene – Lower Eocene was originally thought to occur only in Russian deposits, but has since been recovered from coeval deep sea sediments. It is an excellent marker fossil for that time period. A second specimen appears in Figure 1, below. 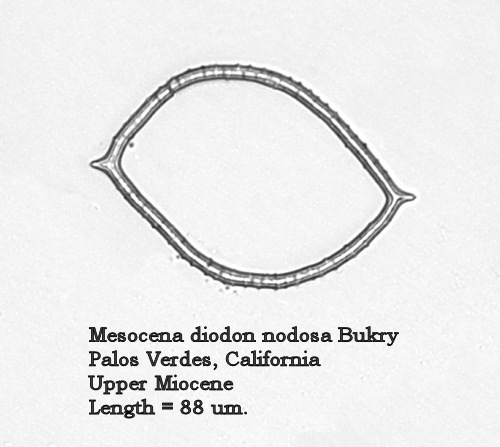 Figure 11 of the earlier paper is more correctly identified as Mesocena diodon nodosa Bukry. This morphotaxon differs from the nominate in having a nodose/crenulate basal ring. For convenience, a second specimen is shown in Figure 2, below. 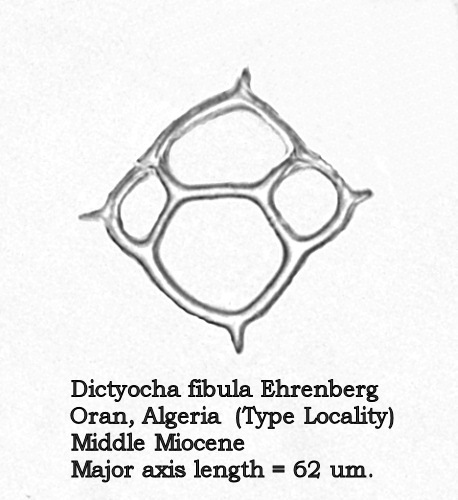 Ehrenberg’s type material for D. fibula came from the Middle Miocene diatomites of Oran, Algeria, a locality well-known to the microscopists of the mid-19 th Century. I have examined an antique slide of material from this locality, mounted by Arthur C. Cole, and noted two distinct silicoflagellates: Distephanus speculum (Ehrenberg) Haeckel and a fairly large dictyochid with a minor-axis bridge, clearly Dictyocha fibula Ehrenberg ( sensu Locker). Many specimens of the latter on this slide are equant, making the major axis difficult to identify, but in forms that are less equant the bridge clearly is parallel to the minor axis. A photograph of one of the equant specimens appears in Figure 3, below. Acceptance of this view necessitates a number of changes in the identifications made in the paper of last summer. 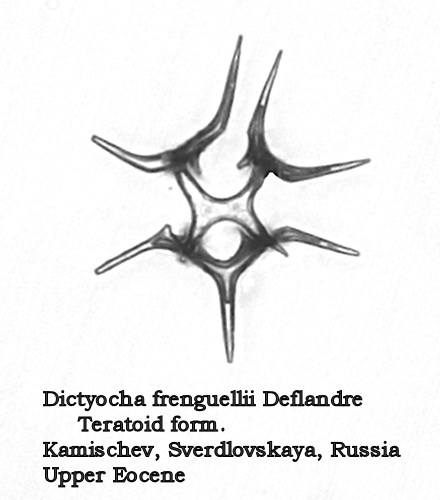 Figures 12 and 13 of that paper, depicting forms with quite different morphologies, were both identified as D. aspera – a name which is now in synonymy with D. fibula. 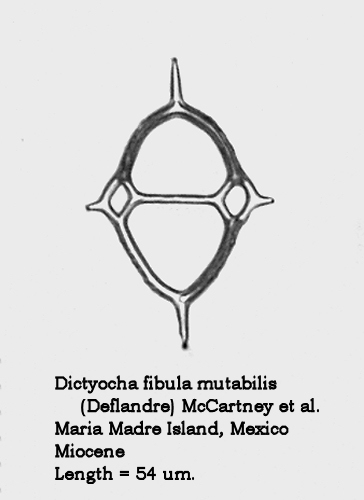 The form in Figure 12 is now known as Dictyocha fibula mutabilis (Deflandre) McCartney, Churchill, and Woestendiek. 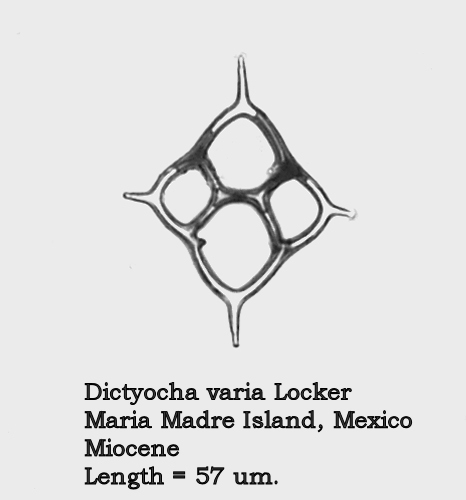 Figure 13 is now known as Dictyocha varia Locker. Better illustrations of these two morphospecies appear in Figures 4 and 5, below. 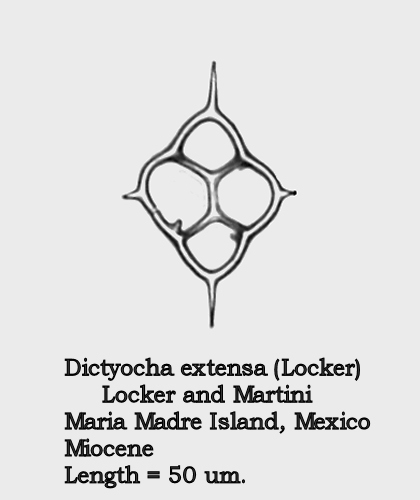 Figure 14 of the earlier paper, depicting a form with a major-axis bridge, and identified there as D. fibula, is now known as Dictyocha extensa (Locker) Locker and Martini. A better illustration of this common Upper Miocene – Lower Pliocene morphospecies appears in Figure 6, below. The dictyochid morphospecies of the Paleocene and Eocene are of considerable interest. 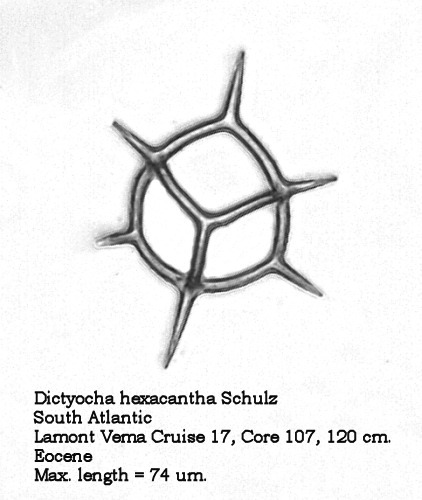 Figures 7 and 8 illustrate two forms of Dictyocha hexacantha Schulz (placed by some authors in the morphogenus Corbisema ). The gracile form in Figure 7 conforms to the original description, while the coarse, nodose form depicted in Figure 8 occurs frequently in some populations. To the best of my current knowledge, these forms have not been distinguished with different names. 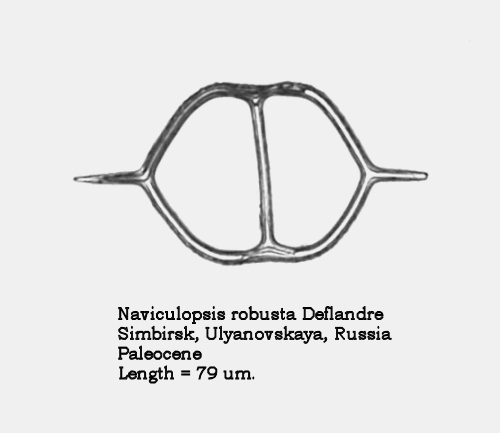 Another interesting morphospecies from this time period is Dictyocha frenguellii Deflandre, illustrated in Figure 9. The struts arise almost perpendicularly to the plane of the basal ring, then bend abruptly to form an apical bridge or X-shaped structure. Four delicate apical spines extend outward from their attachments at the points where the struts bend inward, producing a very distinctive appearance in this apical view. Let us turn now to the morphogenus Distephanus. 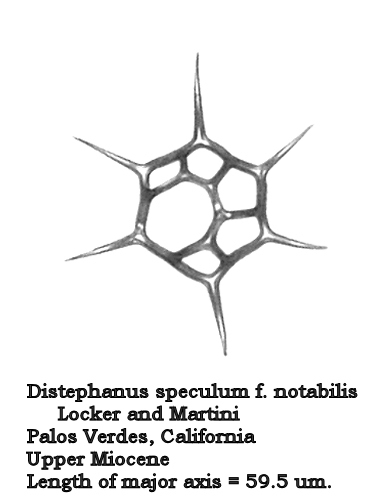 One of the most ubiquitous and long-ranging forms of this group is Distephanus speculum (Ehrenberg) Haeckel. 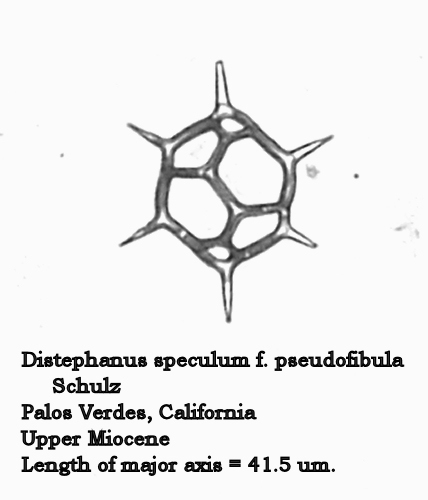 In most samples containing this morphospecies it is quite stable: a 6-sided basal ring, 6 radial spines, and a 6-sided apical window. In other populations we see the development of “cannopilid” forms, where the apical window expands and subdivides into two or more subwindows. In Distephanus speculum hemisphaericus (Ehrenberg) Bukry this process has resulted in a form that is essentially hemispherical in shape, with many apical windows. 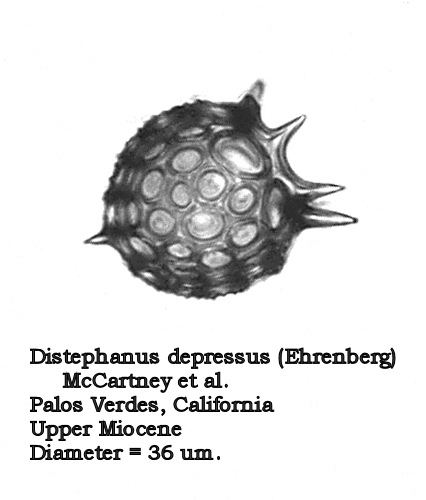 The process culminates in Distephanus depressus (Ehrenberg) McCartney et al., which looks rather like a radiolarian (Figure 10). The apical ring has expanded into a virtual sphere, and the radial spines have angled downward to provide the needed extra space for this development. 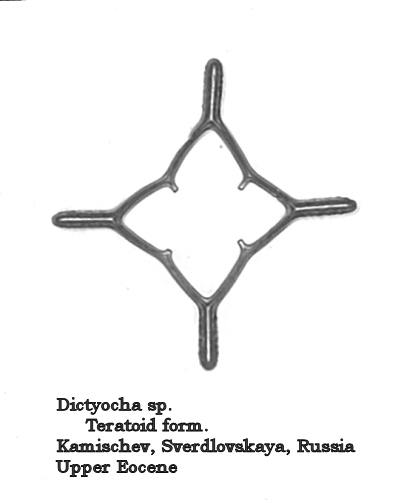 Thus it is suggested that the two periods characterized by the dictyochid forms of the pseudofibula plexus were intervals of ecological stress of an unknown nature. McCartney and Wise further speculate that, for the Miocene – Pliocene interval, there may be a correlation with the termination of a period of terrestrial glaciation. The earlier Eocene – Oligocene interval is well-known to be a time with relatively high rates of extinction in the marine plankton, possibly correlated with an impact event. As noted in the earlier paper, it is not at all clear that the taxonomy of silicoflagellates reflects any form of phylogenetic reality. What do all of these named morphotaxa mean? We are essentially in a state of almost total ignorance. Comments to the author, Richard Carter, would be most welcome! Locker, S., 1974. Revision der Silicoflagellaten aus der Mikrogeologischen. Sammlung von C.G. Ehrenberg. Ecologae Geol. Helv., 67:631-646. 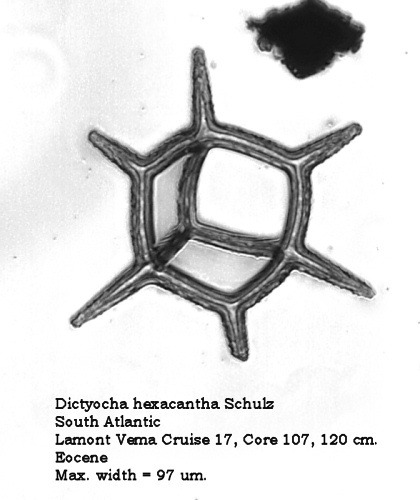 McCartney, Kevin, Sherry Churchill, and Linda Woestendiek, 1995, “Silicoflagellates and Ebridians from Leg 138, Eastern Equatorial Pacific,” Proceedings of the Ocean Drilling Program, Scientific Results, Vol. 138, pp. 129-162. 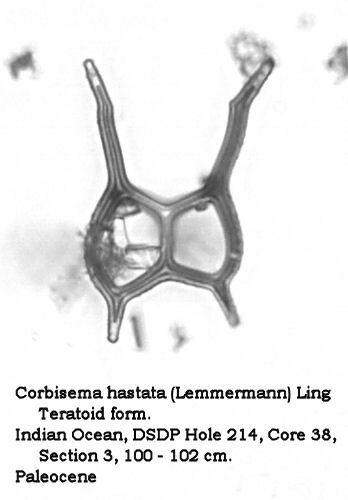 McCartney, Kevin and Sherwood W. Wise, Jr., 1990, “Cenozoic Silicoflagellates and Ebridians from ODP Leg 113: Biostratigraphy and Notes on Morphologic Variability,” Proceedings of the Ocean Drilling Program, Scientific Results, Vol. 113, pp. 729-760. Published in February 2008 Micscape Magazine. Micscape is the on-line monthly magazine of the Microscopy UK web site at Microscopy-UK.